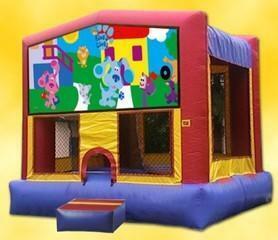 Themed Inflatable fun in this 15' X 15' air bounce house will bring party smiles, laughter and magic to life for your children. Bright, colorful clean Inflatable rents for up to one full day for the same low price! The Air Pillow can accommodate from 9-10 small children at a time with a 500 lb. limit. Moonwalks are not designed to handle teens or adults jumping. You must have a flat area, 17´ x 17´ square for these Air Castles. With 64 different designs now available your favorite characters are waiting for you! Classic design, amble size, high bounce, well ventilated screened safety netting with high visibility and a shade roof with 64 real licensed and original designs to choose among for a full day rental.